John Coltrane was only 40 when he died, but he was already one of the most influential figures of 20th century jazz. His early career gave no indication of the sparks he would ignite. He moved to Philadelphia in 1943, served in the Navy during 1945-46, and returned to play with a variety of jazz groups, switching from alto sax to tenor in 1947. When he joined Miles Davis’ quintet in 1955 he began attracting critical attention. In 1957 he recorded his controversial Blue Train as a leader and played with Thelonious Monk, recording some memorable sessions. He also conquered his addictions and experienced a spiritual awakening which he celebrated in his 1964 landmark session, A Love Supreme. The album garnered two Grammy nominations--for jazz composition and performance. In 1958 Coltrane returned to Davis’ group, appearing on Milestones and Kind of Blue, which introduced Davis’ modal concept and Coltrane’s technique termed “sheets of sound” by writer/critic Ira Gitler. He also picked up the soprano sax, formed a quartet with McCoy Tyner, Elvin Jones, and Jimmy Garrison, and recorded Giant Steps in 1960. 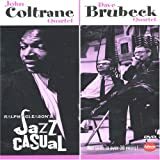 In 1961 he recorded two very different albums--the highly experimental Live at the Village Vanguard and the innovative and commercially successful My Favorite Things. 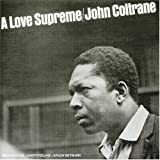 In 1963 he recorded three albums representing the more conservative side of his music: Ballads, John Coltrane and Duke Ellington, and John Coltrane and Johnny Hartman. Coltrane’s expertise on his instrument enabled him to entwine his search for spirituality with his compulsive musical quest. The two had become one, and, while his music was inspired, some found it incomprehensible. After the break-up of his quartet he formed a quintet with his wife Alice on piano, saxophonist Pharoah Sanders, Garrison on bass, and drummer Rashied Ali. Alice Coltrane, after a hiatus in her musical career, returned to performing in 1998, and their son Ravi Coltrane is a noted saxophonist. Some of Coltrane’s work was released after his death, and he received many posthumous honors. In 1982 he was awarded a Grammy for Best Solo Jazz Performance; in 1991 a street was named for him at Universal Studios; he was awarded a Grammy Lifetime Achievement Award in 1992; a stamp with his image was issued by the U.S. Postal Service in 1995; and his albums A Love Supreme and My Favorite Things were certified gold in 2001. A 1957 Carnegie Hall performance with Thelonious Monk was recently discovered and released in 2005. In 1971 a church was established in his name in San Francisco, St. John Coltrane African Orthodox Church, which prospered and aided the homeless until 2000 when real estate development forced the congregation out of its storefront. The church relocated to a shared space and is still active. David Chertok and Burrill Crohn produced a documentary on Coltrane in 1987 which contains interviews and extensive footage of the saxophonist.